Every once in a while, a band I know from home make a run for the hills and produce some seriously good new music. One of those bands are Ocean Flaws, an alt-rock band from Essex. I am lucky enough to know the band personally, so had a quick chat with them before the release of their new EP ‘Dancing To The Fear’ on February the 12th. Hello! So guys, you have a new EP coming out, Dancing To The Fear, just before Valentines Day. What can we expect from the new music? [Alex Pattle – Drummer and Backing Vocals] I think with this EP we’ve really found our sound and it’s one that we believe in and are ready to run with. So hopefully, you’ll hear a lot of conviction in the music and it’ll come across as really authentic for what we’re sonically trying to achieve – which is something in the realm of indie but very modern and quite psychedelic. We’ve really been influenced by the likes of Tame Impala and Foals on this EP, and the songwriting style of The Maccabees is something we’ve studied and tried to incorporate, too – they’ve matured so much over time and there’s loads to learn from them, in our opinion. We’ve already heard ‘Like a Fool’, a re-recorded old favourite, and you’ve just revealed ‘Silver Screen’ – what was the inspiration for that song, and the video? As for the video – pretty weird right? We all sat round one night and brainstormed some wacky ideas. Our very own Quentin Tarantino, (Sean Heaney) then took on those reigns and filmed the thing in a take. In order to convey the song’s eeriness and atmosphere, we thought that a mad getaway scene would be ideal and the masks provided an interesting visual for people watching. The EP was written and recorded with Mitch Ayling from The Milk and even had the tracks mastered in sunny California by Mercury. How did you come by that chance and how did it work out for you compared to previous recording sessions? [CQ] Mitch is a great bloke. We’ve learnt a lot from him over the last couple of years, especially with dynamics, backing vocals and structuring our songs in the best possible way. I remember going out to buy The Milk’s debut album a few years ago and absolutely loving it and then after writing a song called ‘Tonic’ we were looking to get back in the studio. We did some routing around and spoke to a couple of ‘mutuals’ and then rang up to book a sesh! He sorta becomes part of the band when we’re there and knows what we’re all like individually. It’s a comfortable atmosphere at Woods Lodge. Having the tracks professionally mastered was something we were always itching to do. We got to the stage where we were so impressed with the final mix, so why not go the whole hog with mastering? We’re always researching ways to get better and stumbled across Mercury, online – we’re delighted with the results! P.S. If you haven’t gone out and bought Favourite Worry – The Milk, then do it now… it’s a diamond record! You’ve changed your name from ‘The Shermans’ to ‘Ocean Flaws’ – what was your inspiration for the name change? [Sean Heaney – Bass, Rhythm Guitar and Backing Vocals] There’s a few reasons as to why we decided on the name change. Firstly, we’ve had more than a few line-up changes in this band and now that we have the final line-up, we wanted to change the name so that we weren’t affiliated with the previous versions of the group. We’ve taken a huge step forward in the past year in terms of our songwriting, showmanship and attitude that we needed a suitable name for this progression and to prove to everyone that we’re taking this seriously. Secondly, we found out later on in the years of being ‘The Shermans’ that there was a Scottish rock band going by the same name and this was confusing a lot of new listeners on iTunes and Spotify. Confusing people to the point where they were sending us emails asking, “Why have you changed your sound?” I think this was the main reason behind the name change. If we want to stand out to the public and people within the music industry we needed an original name and for it to be easy for them to find us online. It wasn’t easy getting rid of the name ’The Shermans’ as we all have a lot of great memories associated with that name, but I think we’re glad that we all recognised that a name change had to happen. It took months of disagreement and googling to find a new name but we’re all happy with the final result. We’re even happier that everyone who follows us are on board with the name change and prefers the new name as well. I know we were all anxious about announcing us as ‘Ocean Flaws’ but it has definitely paid off. You had a gig at The Workshop in Hoxton, London last December, how was the gig for you, good reception for the new material? [AP] I think we’re all in agreement that it was our favourite gig that we’ve ever done. The crowd were more up for it than they’ve ever been, so we sorta fed off of their energy, and, in turn, they reacted to ours, so we ended up having possibly more fun on stage than we’ve ever had before. That, combined with so much practicing, meant that it was not just fun but also one of our slickest gigs, too, I think. As for the new material, it went down really well. We intentionally opened and ended with new songs, to make it clear from the start – and also, leave it in the minds of the crowd – that this is what we’re capable of, and everyone said afterwards how professional the new ones sound. So, we were really pleased, and now it’s nice to be able to slowly show those people the recorded versions of the tracks. You’ve done a couple of covers over the years, whether it be Thriftshop or more recently Feel Good Inc. – how do you pick what you want to cover, and have you got any others in the pipeline? [Hammish Monk – Lead Guitar and Backing Vocals] I think we were doing some sort of acoustic gig somewhere and we had to memorise so many covers. We sat in Alex’s drum room and chucked out song after song that could conceivably work. We went through everything from Miley Cyrus to Michael Jackson. Once you jam with it, you can immediately tell which ones will stay and which ones will go. Thriftshop and Feel Good always had a place in our acoustic sets, by default. These were a couple of covers that were gradually morphing with every acoustic gig. They had started to evolve beyond exact copies of the original and became imbued with our sound. Since we started out, we’ve done the odd cover in our live sets. We feel like it’s nice for the crowd to hear a familiar song (gets them on your side). So Thriftshop worked its way in, it was simple, energetic and a good sing-a-long. We even ended up doing a live recording of it so people could have it on their iPods. But Feel Good, I think we’d all agree, became a more suitable cover. It was, even more, Ocean Flaws and fitted the new sound perfectly. So for the moment, it’s here to stay. We’re currently working on getting a live and mastered version out there too! Who wouldn’t love that incredibly rich and creamy bassline? I see you’ve been handing out stickers at gigs recently – surely merchandise is the next step? [SH] We have talked about this a few times actually. I think it’s inevitable. It would be really cool to see people walking around in the street with ‘Ocean Flaws’ or lyrics from one of our songs written on their top but I think the normal merch like t-shirts and posters are a bit of a cliche move. We need to think of other ways of getting our name onto merchandise. I remember a few years back that Bob Dylan used to sell Laptop bags and Eminem used to sell urinal mats at shows (I don’t think I need to explain what the urinal mats are used for) – we need to come up with a whacky idea like that. Something that everyone needs. An Ocean Flaws toothbrush or an Ocean Flaws waffle iron. Something along those lines. As soon as we come up with a spectacular Ocean Flaws product, expect to see it at our gigs and on our website. After the release of the EP- what are your plans for the future? Proud Camden and Borderline will be on our list; we’ve had great times at those places. I had the idea of arranging a show swap with some band up North, so if you fancy seeing us on the Hebrides Islands, we’ll give you a free ticket to make up for the travel costs (note: we kept this part in so they have to keep the promise!). But as for the more distant future, we’re constantly writing and emailing riffs back and forth so I’m sure we’ll eventually come back with another EP, hopefully, better than the last. We love writing, recording and gigging, regardless of how well our music does. Sean will probably be writing skiffle albums from his retirement home in sixty years! 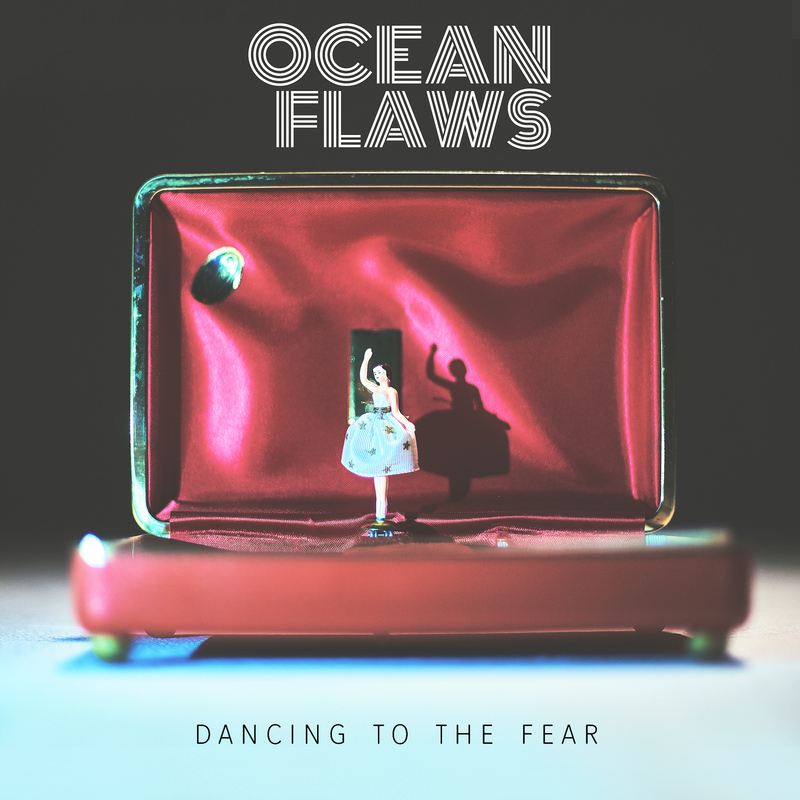 Ocean Flaws are set to release their new EP ‘Dancing To The Fear’ on February the 12th.